back in 1999 when I first learned about the trafficking of young girls from nepal into india, it bothered me, but i thought, i’m just me. who am i to do anything about it? but when i started taking steps to return to india, i soon realized that it’s not just me doing this. it’s we! i’m not going it alone, because you are all part of this now. among the first to join were the faithful women of my bethany adult bible fellowship class, who made a splash on my birthday and are always there for me. 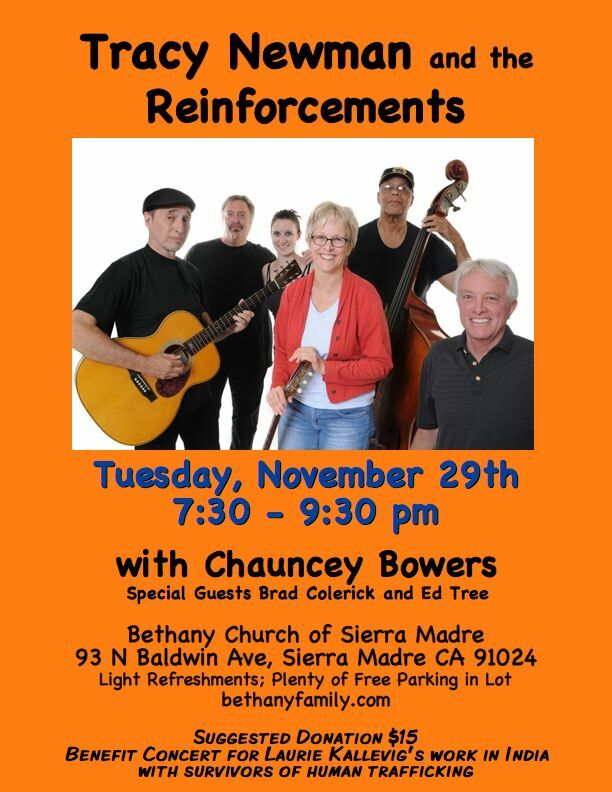 then the fabulous tracy newman and the reinforcements volunteered to do a benefit concert for me! this was huge. huge. i first heard tracy two years ago at brad colerick’s mid-week, soul-soothing, spirit-lifting hootenanny in south pasadena (wineandsong.com). it’s every wednesday night, and it’s free, and it’s wonderful! and if you’ve never heard tracy newman and the reinforcements, “like” the band on facebook, find out where they’re playing next, and do yourself a favor and go! before long chauncey bowers, ed tree, lisa turner, and the aforementioned brad colerick were on board for the benefit. my best so cal pal sharon printed flyers and promoted tirelessly, suzanne and keri coordinated, tracy and alexia promoted, leslie and nilo cooked a magical spaghetti dinner for the crew, john and amber brought dessert, judy and janice jumped onto clean-up detail, lois welcomed, brendan did amazing sound, church peeps brought cookies, dave hosted the delightful coffee and cookie break, and sharon and geoff managed the welcome and bank table. all this combined with two hours of wonderful music made for a smashingly successful event that brought together my church family, my music family, my twin sister, my landlord, and many people i’d never met before, but who wanted to support my work. we raised $2700 at the event, and more money came in before and after from people who couldn’t attend. and it’s not just financial support, but awareness of the issue, readers for my blog, words of encouragement, lots of hugs, and much needed prayer support. so for all of you who came and went and gave and helped and played and listened and hugged and read and prayed — thank you thank you thank you for joining me!! so what are we doing first? we’re heading to bangalore, where we have friends, to set up base camp. we’ll need a cell phone with an internet plan and an indian bank account, so we don’t get charged fees right and left for transferring money or using the atm. and then we’ll need to resume our study of hindi. we want to get beyond the beginner stage in the next six months. soon we’ll be volunteering with organizations in the far reaches of india. so learn to love the suitcase. and then let’s communicate often! — on facebook, via emails, and on this blog. next blog post: the kindness of strangers, or it’s day three — why don’t i have a cell phone or a bank account yet?, or how i didn’t get to the christmas play on time, or something like that! !